ST. LOUIS — The alumni groups from the St. Louis Blues and Chicago Blackhawks are taking their long-time rivalry to Peoria for a charity game on Jan. 15. 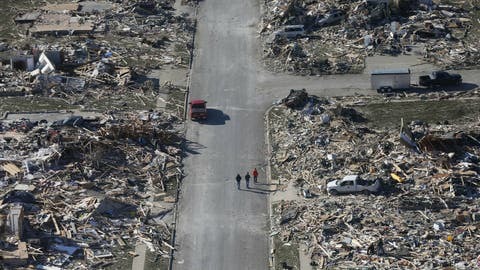 The event, an exhibition game between Blues Alumni and Blackhawks Alumni, will be at Carver Arena in Peoria, with the proceeds being distributed by the Salvation Army Tornado Relief Fund to help the communities in Central Illinois affected by the EF-4 that devastated the area on Nov. 17. "I decided to make a few phone calls to see how difficult it would be to get the alumni together," says event organizer Denis Cyr, who played for both organizations and now works for the Peoria Rivermen. "Last year we had in Peoria it was 30 years of hockey and we had the Peoria Rivermen alumni and it went great. So I decided to call the people I know in St. Louis and call the people I know in Chicago, since I’m an alumni on both sides, and since then everybody’s loved the idea and everybody’s been very helpful in putting this event together." The alumni groups will play two 30-minute periods. There is a $10 per person donation at the door for general seating. Doors open at 6 p.m. with the face-off set for 7 p.m. following a special pre-game ceremony. There will also be a 50/50 raffle with tickets sold by 2013-14 Peoria Rivermen players and a silent auction for fans to bid on Blues and Blackhawks jerseys. "Kelly Chase was in contact with Denis Cyr, one of the managers from Peoria Rivermen and they started talking about this game and asked if we alumni would be interested in coming down and he told him we would," says Terry Yake, a former Blues center who now works with the St. Louis Blues Alumni Association. "From there it’s kind of just taken off." Cyr has seen the interest for the event soar from fans and sponsors. "Everybody wants to be a part of it," Cyr says. "(Tuesday) morning guys from Coca-Cola called me and they want to be a part of it. I think it’s a great thing. Everybody realized it’s for the disaster area and people need some help and everybody wants to help out." The St. Louis Blues Alumni Association, formed in 1988, has helped raise more than $4 million for local charities and more than $750,000 for amateur hockey in the St. Louis area, according to its website. Yake, who played in 403 NHL games with the Whalers, Maple Leafs, Blues and Capitals from 1988 to 2001, says the Blues Alumni team participates in anywhere from four to eight charity games per year. But this one will be different than those. "This will be the first one we’ve had against the Blackhawks," Yake says. "A lot of them are local games, like we’ll play Lindenwood, we’ll play with the fire and police. Last year we went to Nashville. We’re trying to set up some more games versus other NHL alumni teams like Nashville again, the Dallas Stars’ alumni, now the Blackhawks. I think it might be a little more fun and entertaining for the fans." The location should add to the interest. Peoria sits in between the two hockey hotbeds and there are plenty of Blackhawks and Blues fans living in the area. The action on the ice between the Blues and Blackhawks has been fun for the fans from the Gateway City so far this season. The Blues have won all three meetings during the 2013-14 season, including the thrilling shootout win Saturday night in front of a standing room-only crowd at Scottrade Center. Weâll see how that translates with the alumni squads on Jan. 15. "I think players like to have fun and like to get involved and I think this was a great opportunity for all of us," Cyr says. "I think it will be a fun game. It’s always fun to see old friends and people you used to play with or play against. So I’m sure there will be a lot of camaraderie." You can visit www.skatestronghockey.com for more information.